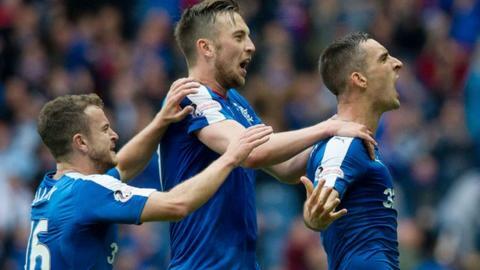 Rangers made it nine league wins in a row with a narrow victory over a spirited Falkirk side in the Scottish Championship. Dean Shiels gave the league leaders an early lead, but a stunning strike from Will Vaulks saw Falkirk equalise. The match looked like it might be heading for a draw and Rangers first dropped points of the season, but James Tavernier hit a late free-kick. Lee Wallace wrapped up the victory with a strike in injury time. Rangers made the perfect start. Some neat interplay between Shiels and Martin Waghorn unlocked the Falkirk defence. A back-heel from Waghorn allowed in Shiels who fired home from close range. Falkirk refused to crumble, and were level thanks to a stunning strike from Vaulks. From a long way out the midfielder arrowed a shot into the corner of the net, leaving Rangers goalkeeper Wes Foderingham with no chance. Vaulks celebrated his spectacular strike with a similarly impressive series of somersaults. In the 32nd minute a superb attacking move from Rangers saw Wallace cut back for Jason Holt. His shot looked destined to bulge the net but Falkirk keeper Danny Rogers pulled off a great stop to tip the ball over the bar. Waghorn then weaved through the Falkirk defence but dragged his shot wide of the post. In the second-half Rangers continued to struggle to find a cutting edge. A turn and shot from Shiels was well saved by Rogers. Falkirk almost took the lead when a Tom Taiwo shot was spilled by Rangers goalkeeper Wes Foderingham, who recovered the loose ball just before John Baird could pounce. With ten minutes to play Rangers won a free-kick on the edge of the box. James Tavernier took it and curled it perfectly into the corner of the net to send the home crowd wild with delight. Kenny Miller almost made it 3-1 after he rounded the goalkeeper, but his effort was cleared off the line by Mark Kerr. Lee Wallace would make it 3-1 deep in injury time with a fine effort from 20 yards. Match ends, Rangers 3, Falkirk 1. Second Half ends, Rangers 3, Falkirk 1. Corner, Falkirk. Conceded by Rob Kiernan. Attempt blocked. Craig Sibbald (Falkirk) right footed shot from outside the box is blocked. Attempt missed. Blair Alston (Falkirk) right footed shot from outside the box is high and wide to the right. Goal! Rangers 3, Falkirk 1. Lee Wallace (Rangers) right footed shot from outside the box to the top right corner. Substitution, Rangers. Dominic Ball replaces Dean Shiels. Attempt missed. Aaron Muirhead (Falkirk) right footed shot from outside the box is too high following a set piece situation. Substitution, Falkirk. Lee Miller replaces Mark Kerr. Attempt missed. James Tavernier (Rangers) right footed shot from the right side of the box is just a bit too high following a corner. Corner, Rangers. Conceded by David McCracken. Attempt blocked. Kenny Miller (Rangers) right footed shot from the left side of the six yard box is blocked. Corner, Falkirk. Conceded by Lee Wallace. Attempt blocked. Will Vaulks (Falkirk) right footed shot from the left side of the box is blocked. Danny Wilson (Rangers) wins a free kick on the right wing. John Baird (Falkirk) is shown the yellow card. Goal! Rangers 2, Falkirk 1. James Tavernier (Rangers) from a free kick with a right footed shot to the bottom right corner. Kenny Miller (Rangers) wins a free kick in the defensive half. Attempt saved. John Baird (Falkirk) right footed shot from the right side of the box is saved in the top right corner. Attempt missed. Martyn Waghorn (Rangers) right footed shot from the right side of the box is just a bit too high. Jason Holt (Rangers) wins a free kick in the defensive half.